A research team led by Dr. Shuhei Masuda, Group Leader at Research and Development Center for Global Change, the Japan Agency for Marine-Earth Science and Technology (JAMSTEC: Asahiko Taira, President) has developed a new prediction scheme for the El Niño phenomenon based on the discovery of new types of tropical climate variation. The work was carried out in collaboration with researchers from Kyoto University. The above results were posted in Nature Scientific Reports on November 25 (JST). This project was supported by the Ministry of Education, Culture, Sports, Science and Technology (MEXT) of Japan (Research Program on Climate Change Adaptation [RECCA] 10101028). 2. Environmental Satellite Applications, Wales, U.K. Figure 1: Predicted NINO 3.4 (5°N–5°S and 170°–120°W) SST (sea surface temperature) anomaly (red and blue curve) as compared with observed SST anomaly (black). 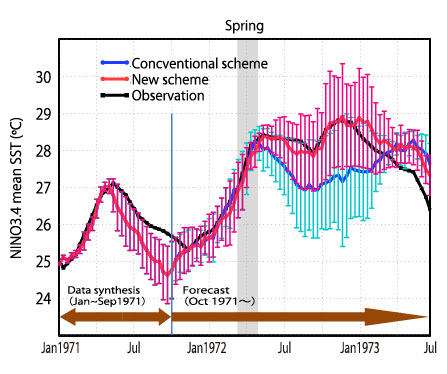 The values are for hindcast experiments during 1971–1973 derived from the conventional case without seasonal control (blue) and the new case using a seasonal adjustment factor (red). 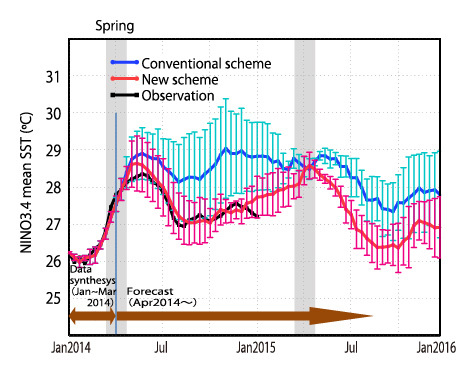 Grey shaded regions denote the boreal spring periods.